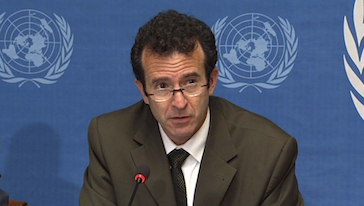 Paul Spiegel is the Deputy Director of the Division of Programme Support and Management at the United Nations High Commissioner for Refugees (UNHCR). He was previously Chief of the Public Health and HIV Section at UNHCR, where he still serves as the Refugee Agency’s HIV Global Coordinator at UNAIDS. Before UNHCR, Dr. Spiegel worked as a Medical Epidemiologist in the International Emergency and Refugee Health Branchat the Centers for Disease Control and Prevention (CDC). Previously he worked as a Medical Coordinator with Médecins Sans Frontiéres and Médecins du Monde in refugee settings in Kenya and DRC as well as a consultant for numerous organisations. He received his medical degree at the University of Toronto and his Master of Public Health and specialty in Preventive Medicine at Johns Hopkins University. He has won numerous awards including CDC‘s Charles C. Shepard award for outstanding research in Assessment and Epidemiology.